So you’re already convinced to travel sustainably, but don’t know what to pack? 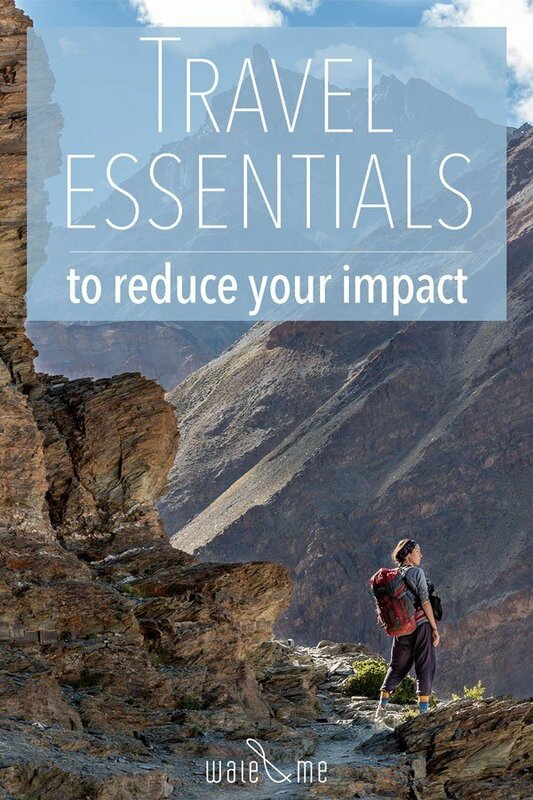 Here are the travel essentials we carry that help us significantly reduce our negative impact when on the road. With them in your suitcase you’ll be prepared to lower your waste and contaminate less no matter where you are! 1. No more packaged water please! Carrying a reusable water bottle is a habit everyone should adopt regardless. With an estimated 1 million plastic beverage bottles being bought around the world every minute (yes, you read it right), and less than 10% actually being recycled, every bottle bought is one to many. As soon as you get into the habit of taking your bottle with you, it becomes second nature. And it will probably help you keep hydrated and save you money in the process. Material: Apart from the BPA-free known requirement, there are many components in plastics that leach chemicals (we’ll talk about this in more detail in the future). It is unclear to what level these chemicals affect us, but why take the risk with so many options around? We would recommend choosing glass, aluminium or steel. Size: What works for you will vary according to the circumstances. When traveling, refilling your bottle is not always that easy; Being stuck in a train for 20+ hours you’ll quickly regret only having a 0,5L container with you. So for us, we knew we needed more (we have two 1182ml (40oz) bottles with us). However, if you just use it for quick outings and know you’ll be able to refill it easily, a smaller size may be much more convenient. Having a reusable bottle is only one part of the solution. When traveling, finding safe potable drinking water on the go is not always an option, or sometimes plain impossible. In our past travels we found ourselves buying up to 8x1L bottles a day to ensure we were safely hydrated, and the guilt associated was driving us crazy. It is therefore that this time around we knew we needed a solution. Here is where water purifiers and filters come in. 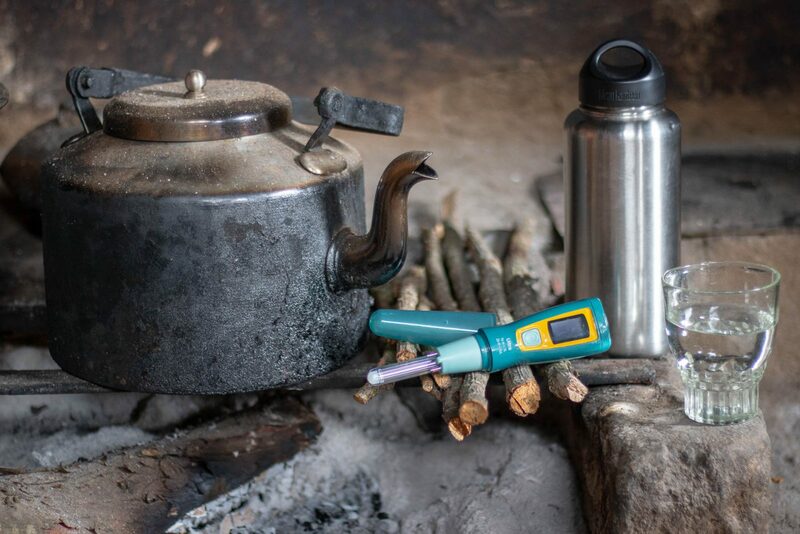 For us, the best option was getting a Steripen, a water purifier that kills bacteria and viruses with UV light when stirring the water for a minute and a half (read their instructions carefully though!). Four months in and we’ve drank from the dodgiest of sources without issues. We also cary iodine tablets as a backup, but haven’t had to use them yet. 2. Reusable bags are the bomb! Here is another habit that should be embraced into everyday life: carrying reusable (and produce) bags. Although accessible to everyone, it is similarly easy to let this habit slip whilst traveling. In case you need the scary stats to get you going, here’s the deal: an estimated 500 billion to 1 trillion plastic bags are used every year worldwide. On average, they are only used for 12 minutes before being discarded, by the time when merely 1 in 200 plastic bags gets recycled. What happens to the rest? They end up in land-fill, in our oceans, in birds’ stomachs.. everywhere, and take up to 1000 years to break down. I mean, does anything else need to be said?! Having a tote always with you will come in handy every time you decide to buy anything at all, but produce bags are what make buying food in bulk really easy. 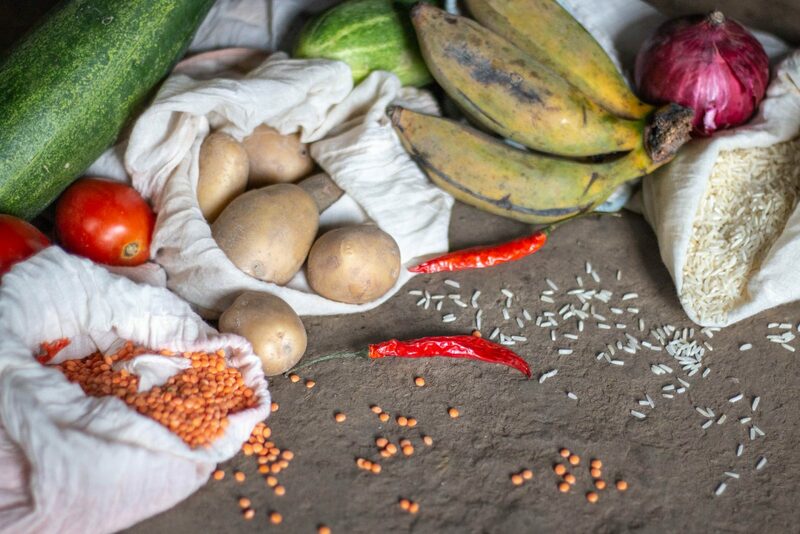 Be it travelling through trendy New York, or through small villages in Sri Lanka, you are bound to find plastic-free grocery shopping options. We use our produce bags on the daily, to buy some carrots to snack on, or bulk lentils to make a hearty meal when we have a kitchen. They also come in handy when going to the bakery to buy cookies, or when we want to stock up on nuts. So get (or make) yourself some lightweight bags (we prefer them in organic cotton) and start looking out for all the yum things you can buy in bulk. Although steps are being taken in many countries to ban certain single-use items, plastic throw-away containers and utensils are the norm. 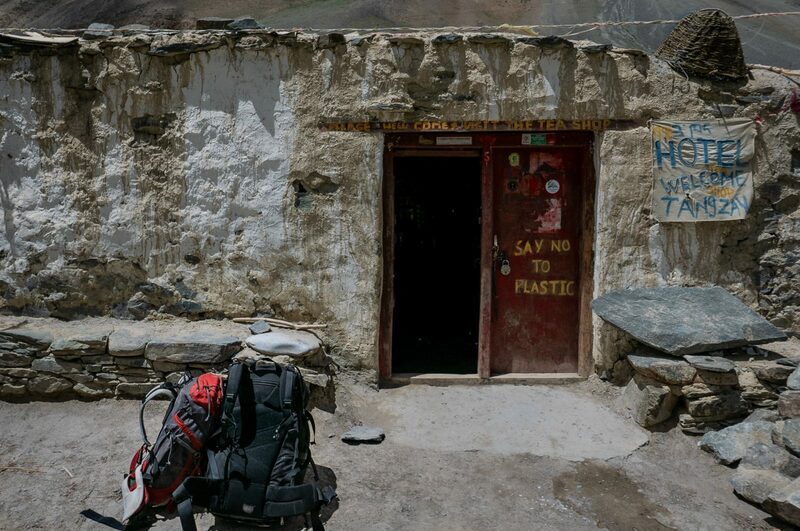 The westernised single use culture is spreading everywhere, and it takes some hurdles to avoid the styrofoam plates, plastic forks and single-use coffee/tea cups, when on the go. If you want to make sure you don’t miss out on any of the delicious foods and drinks around, you gotta be prepared. We carry a metal cup for any yummy chai or fresh juice we can find, a Tiffin (metal Tupperware/lunchbox) for all our meals and cut-up fruits whilst moving around, and a metal straw that comes handy when drinking fresh coconuts from local stalls. We have bamboo cutlery for eating on the streets and when carrying our own food, and if you’re skilled with chopsticks, you can just carry them instead for even less bulk. 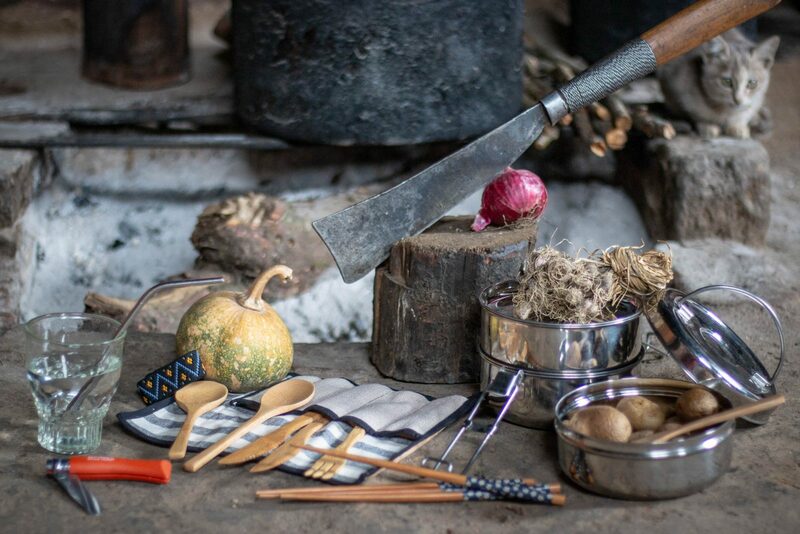 We have a knife (just a pocket knife, no 100-option Swiss army machines) and a peeler to prepare almost everything we eat, topped of with a tea filter to drink some delicious loose-leave tea. What is contained in our toiletry bags can greatly reduce our impact. And although there are many products to analyse, we’re just going to focus on the main ones. If you haven’t switched to natural cosmetics already for your own health, then at least consider them for the sake of others and the environment. More often than not in our travels, we see the shower drain leading directly to the garden. And even when it is not so evident, the chemicals contained in your hygiene and beauty products will end up seeping into the earth and water of the places you are visiting, and can greatly affect ecosystems as a whole (just take a look at the effect of sunscreen on coral reefs!). Watch out for the ingredients contained in your soaps, toothpaste, deodorant, cosmetic products, sunscreen, and even insect repellent. Choosing natural options will also be healthier for you! You can also save on a lot of plastic if you choose what you carry correctly. A good bar of soap can be used to wash yourself and your clothes alike. This will also save you some weight and prevent the feared suitcase shampoo explosions. And if you don’t find one that meets all your needs, you can always carry multiple (we have a special face soap and a solid shampoo as well). Toothbrushes make up a big part of our waste and it is estimated that we use on average 300 throughout our life. Tens of billions are thrown away every year around the world, and no good recycling options exist. And yet, it is an easy change to start using bamboo toothbrushes that biodegrade after a couple of weeks. So far, they haven’t fully figured out plastic-free vegan bristles, but the waste difference is still substantial. Lastly, this is just for menstruating ladies, but a biggie. As it turns out, periods are not only a pain (no frolicking through fields business for me at least), but also now incredibly contaminating because of modern hygiene products (aka tampons and pads). 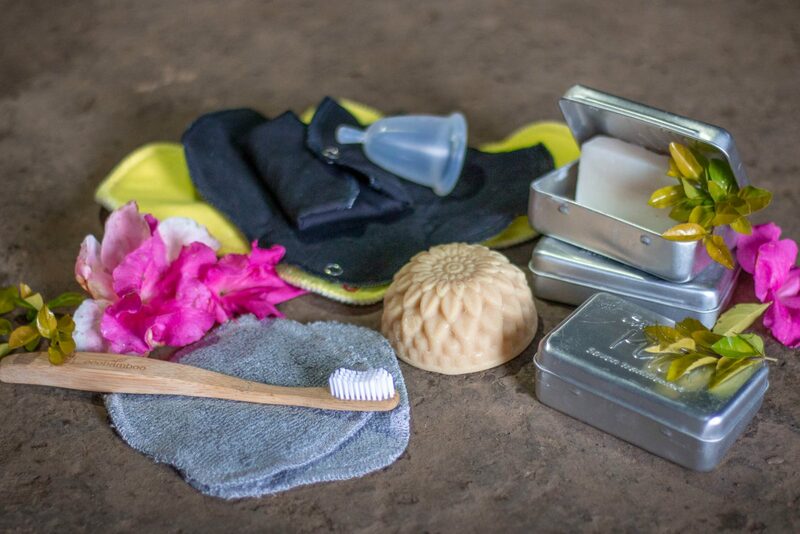 If you add to that, that whilst traveling it can be difficult to find the product of your choice, and you may not want to have to fill a suitcase with tampons and pads (that would be a weird decision), adopting more sustainable period habits seems like a no brainer. In come the famous menstrual cups and reusable pads. What you choose is of course very personal, but I would recommend trying out what suits you best before leaving so you’re not caught off guard on the road (been there, done that). Oh and black fabric pads all the way. The colours and patterns may be cute, but you’ll be regretting that choice as soon as you find yourself scrubbing the blood off by hand. Of course this list is not exhaustive; there are many more things we’ll discuss in future posts. But with these travel essentials in your bags, you’ll be one step closer to traveling sustainably! Still need more help with what to take with you? Get* our full printable packing check-list to see a detailed overview of what you may need. And you can adapt it to your needs! *Full disclosure: this will add you to our email list. We promise to only send interesting stuff but you can anyway opt out at any moment. This article is not sponsored, and contains no PR samples or affiliate marketing links. We actually bought all articles mentioned ourselves. Thank you so much for your kind words. We really appreciate you reading the blogpost!